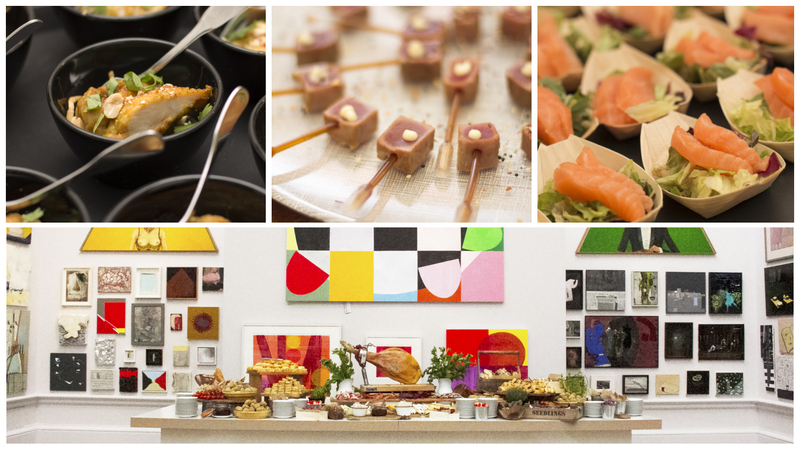 We’re still bubbling from our latest summer event at the prestigious Royal Academy of Arts. The JM Finn & Co summer party took place in the galleries of the annual highlight of the arts calendar- the RA Summer Exhibition, which has been running since 1769. The Summer Exhibition is the world’s largest open entry exhibition where the quality and variety never ceases to amaze, so we had to ensure our food shone just as brightly as the colourful art work. 850 guests were treated to an abundance of delicious food, including canapés, bowl food, and live food stalls around the gallery. Our summer inspired menu featured bites such as seared tuna, furikake spice, with a dashi pipette, and Manchego gougere, Iberico ham, with a touch of saffron. Bowls full of flavour such as Korean fried chicken, toasted peanuts, and kim chi slaw, were circulated by the Tonic team dressed in bright aprons to reflect the summer vibe felt throughout the venue. Our statement charcuterie, sushi and poke food stalls offered an interactive experience for guests, with dishes created in front of their eyes by our charming chefs. Generous helpings of cured meats and cheeses graced our charcuterie stall, with sides of warm spicy nduja sausage rolls and mushroom and summer truffle tarts, creating the perfect picnic platter! Across the gallery our sushi and poke stall offered premium maki and nagiri, and raw fish delights such as salmon with tiger milk, black rice, and an avocado and sesame dressing. Guests were truly spoilt by the choice of food, and the variety of flavours and combinations Tonic concocted in the kitchens. We cannot forget pudding, as our chefs spent ten hours creating colourful layered verrine masterpieces. Little pots of indulgence adorned the stall, and our favourites have to be our coconut pannacotta, lime jelly, topped with a mango mousse, and a raspberry jelly, with Matcha tea custard, and pistachio topping. We sold out! Guests were enjoying the stall so much, they started to eat our decorative jelly babies! So, the night had to end there, once more all those at Tonic excelled themselves.